You know wheat is recommended as a vital part of any long term food storage plan, but after you have those buckets or cans of wheat in the food storage room, what are you going to do with it all? Even if you have a grinder and can grind it into flour, that will certainly not provide all the nutrients you’ll need if whole wheat becomes a major staple in your diet. So where can you get more information on using wheat? How to Live on Wheat by John Hill is a quick, 134 page resource for using wheat. He covers a lot of information in that little book about wheat as well as other grains including rice, buckwheat, quinoa, corn, amaranth and more. There is also information on basic uses of legumes to complement your wheat storage. He discusses nutritional considerations and how to store your grains and legumes (although I don’t fully agree with the part about oxygen absorbers killing your wheat’s germination ability). One of the sections I really enjoyed was the chapter on making and cooking with sprouts. Sprouting wheat brings out a lot of the “fresh food” nutrients that you’ll be lacking in a survival diet. I love to eat wheat sprouts just plain, but John has quite a few recipes for using sprouted wheat both raw and cooked. One for essene bread dating clear back to bible times. It’s on my list to try cooked in the Sun Oven. Wouldn’t that be fun? He also includes whole wheat bread recipes and other recipes for using wheat that has been ground into flour, as well as how to make gluten, pasta, and dumplings with your whole wheat. 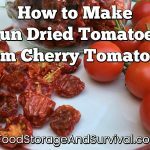 There are sections on cooking with corn, cooking and baking in cast iron, and essential tools and supplies you’ll need to be able to best use your wheat supply, as well as a listing of how much wheat, grains, and legumes you should store. There were some paragraphs that kind of wandered and left me wondering why that particular fragment was in there, but in continuing to read all the questions were cleared up and the topics were all covered. This book also completely lacks illustrations, which I really like to have as a personal preference. However, the information is good and covered well, and I’ve added a couple things to my prep list after reading this book. 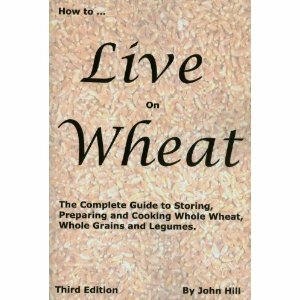 So if you’re looking for a resource on how to use all the wheat in your food storage, even if you already have another book on wheat (which I do), you’ll likely learn something new (as I did) from John Hill’s How to Live on Wheat .